If you are looking for the Pemberton Genealogy Storehouse, it is here: PembertonGenealogy.Com. You will need to log in there. Great research technique requires great care. One should always check the accuracy of extractions and indices such as this. When possible go all the way back to the original document or a photographic image of it to be sure the alleged record is really there – that the extraction was done correctly. Also, you will often find clues there that would have been missed if you had not reviewed the transcription’s accuracy. Genealogical data extracted from Parish Registers, Wills, Tax Records, etc are placed in the genealogical tree named “Extractions Tree”. This “tree” comes from a single GEDCOM file created by special computer programming done by the technologist@pembertonfamily.com. 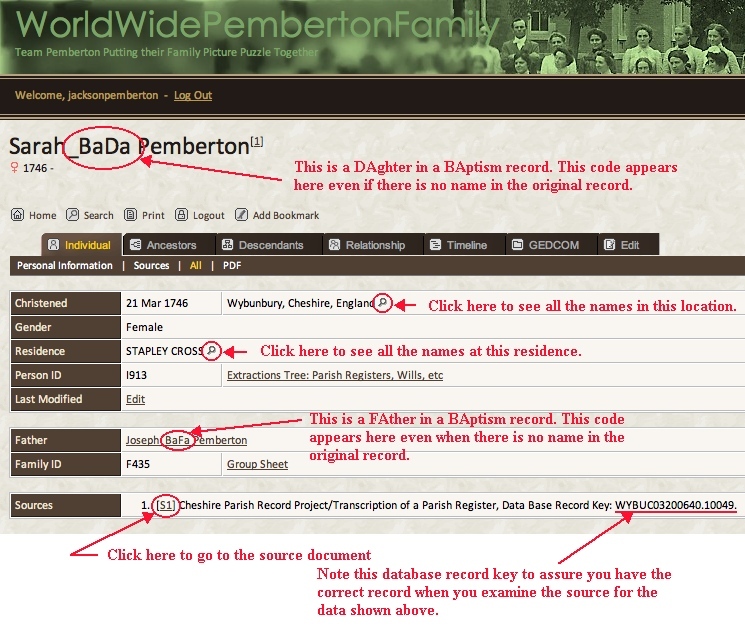 As data becomes available, it is processed into the standard GEDCOM format so that it can be uploaded to the Extraction Tree and become useable to members of the Pemberton Family World Wide. The reason this data has been processed thus is to make it searchable in many convenient ways. For example, one might look for a William Pemberton and find one of interest residing in Norcroft. One can immediately do a search of all records that have a Norcroft place associated with them. The search engine in the PFWW genealogy site has a very large number (over 50) of parameters by which one can search the data: for example by occupation, rank, emigration place, and dates. Because this data is very fragmentary, it does not appear as an ordinary pedigree chart but rather as thousands of tiny pedigrees. Each parish register baptism or death record, for example, is processed into a micro pedigree so that it shows the correct relationship between parents and children. Since the earliest records are very terse and so that Pemberton researchers using this data can easily comprehend what they are seeing in a search result, the first given name always has a code appended to it.·If there is no given name, the code appears where the Christian name should have been. BaSn – A son in a baptism record (Note that if the gender of the baptismal candidate is unknown, this would be BaCh. The picture below shows how a simple baptism record is enhanced and displayed in a typical genealogical presentation mode. The names are tagged so that the researcher immediately sees what kind of data he is looking at. The genealogical engine makes navigation among records and juxtapositioning of similar records simple and powerful thus enhancing the discovery process for the researcher.